It was one of those magical evenings - unplanned and unforgettable. Our ship had been visiting the fascinating capes and bays of the Antarctic Peninsula. We had witnessed spectacular landscapes of mountains and glaciers and had crammed in visits to clamouring penguin colonies populated with tens of thousands of birds. Normally, after dinner, the vessel would be steaming on to the next days destination but the timing in this case meant that we had a few hours to spare. 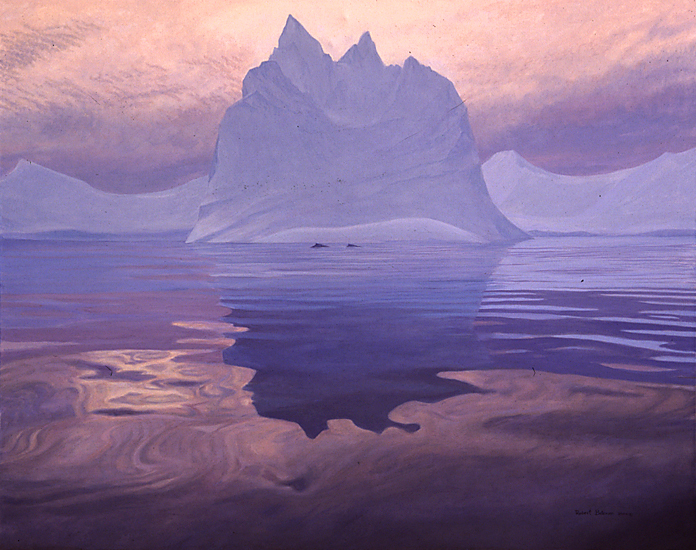 The sea was like glass and on the spur of the moment the expedition leader decided to lower the Zodiac inflatables so that those who wished it could have a peaceful, almost private tour among the ice floes and bergs. The long polar twilight turned the sky and sea into a lavish and changing display of colour. The ocean was so calm it was as if we were suspended in an undulating spectrum. The great bergs towered above us as sculpted mountainous islands from some ancient fairy tale. Giant humpback whales would be mere specks in comparison. We did not actually see them that evening but they could have been there. The next day we had the thrill of a lifetime when one "spy hopped" a few feet from our Zodiac, its encrusted face poised vertically, and examined us for several long moments. We had been seeing humpbacks almost daily so I added a couple of the world's largest animals as contrast for the majestic icescape."